After my son’s wedding got over, my bhabhis kept insisting that I tell them how much my wedding sari costed. Basically, when a daughter’s kids get married, in our tradition, the wedding sari comes from the parents home or the mayka. I bought the sari of my choice and my bhabhis and brothers wanted to reimburse me for it. Usually any cash received as a gift gets used up in household expenses. Though I may keep it aside, it eventually gets used up. So this time I requested them to get me an ice cream maker instead. They bought a Cuisinart ice cream maker for me and I was absolutely thrilled. The next worrying bit was how to carry the machine all the way from London to Mombasa. I obviously left some of my saris back but made sure the machine was in put in the main luggage. Reaching the Mombasa airport customs clearance, we declared that we have an ice cream machine with us. The custom officer was more interested in knowing why I needed an ice cream maker and not any other machine. I tried to explain to her that we don’t get it here, that it was a gift etc etc. Then started the whole how to use the machine exercise and after paying the duty we were allowed to leave the airport. Patience was the name of the game to get the machine out! I finally got some fresh cream at the supermarket and immediately decided to make the ice cream. Boiled beetroots were staring right at me. I couldn’t wait to get any other fresh fruit so beetroot it had to be. The bowl was in freezer since the day we arrived from London. If the bowl is ready, then its easy to make the ice cream. Can’t decide which ice cream maker is more noisy, mine or my son’s 🙂 I browsed the internet and most recipes I came across were with eggs. So basically getting the idea from good food channel, I decided to stick to the basic recipe I used for the blueberry ice cream and made an eggless version. A big thank you to my brothers and bhabhis. As hubby dear put it correctly, Mayuri has got a new toy! Remember to place the freezing bowl in the freezer for 8 to 12 hours. Put the beetroot, sugar, vanilla extract and milk in a liquidizer. Process till the beetroot is crushed completely. Add the whipping cream and process for a few seconds. Chill the beetroot liquid for 30 to 60 minutes. Add the liquid to the frozen bowl and churn it. It took 20 minutes in my ice cream maker. If you want to serve soft ice cream, scoop it into serving bowls and garnish with roasted nuts or chocolate chips and serve. If you are not serving the ice cream immediately, put it in an airtight container and place it in the freezer. After 30 minutes the consistency will be semi hard. Add a bit more sugar if you like a sweeter ice cream. For a completely smooth texture, sieve the crushed beetroot and milk mixture before adding the cream. I want few scoops of this eye catchy icecream..Soo colourful. 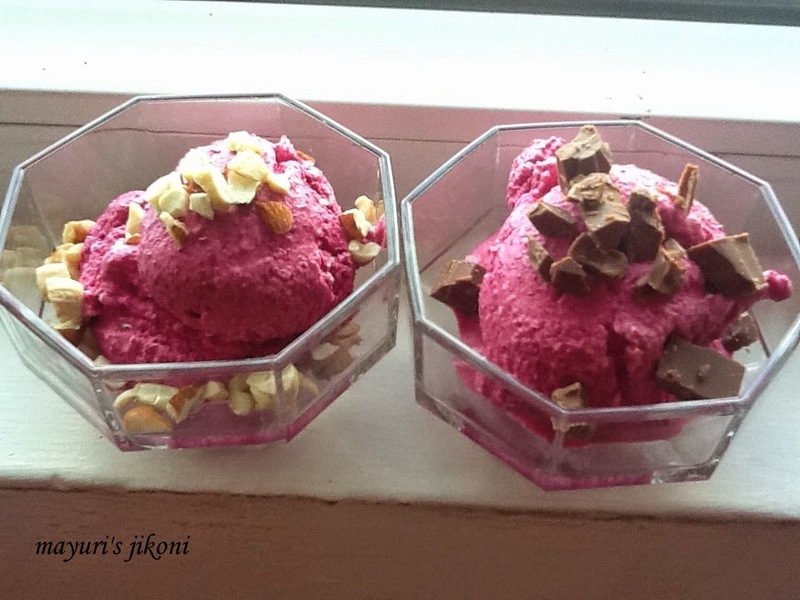 I love the healthy version of the ice-cream using beetroot the least favorite vegetable. The colour looks amazing and who doesn't love ice-cream.